Kotarō is the wild card in the series who strives to perpetuate endless chaos. When his master hears of Ieyasu's retreat at Mikatagahara, he is ordered to assist Shingen with the pursuit. Although he does capture Ieyasu, Kotarō also kills Shingen to counteract the results. In a bid to spare their lives, Ieyasu and his men are forced to serve Kotarō and surrender to the Hōjō. During his time of leisure, Kotarō learns of Nobunaga's infamous "Demon King" reputation. 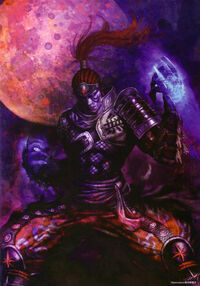 Thinking at first that Nobunaga desecrates the demon name, he rides alone to disrupt the battle at Osaka Bay. Kotarō eventually sees the man himself and foresees his adversary's fiery end. More amused by the image, he decides to stay his hand and leaves Nobunaga to his fate at Honnōji. Power shifts to Hideyoshi and the large Tokugawa-Hōjō army lay siege to his residence, Osaka Castle. Hanzō, who is displeased with Ieyasu's enslavement to Kotarō, seeks to liberate his true master. Intrigued, Kotarō challenges his rival to a contest to see who can kill the land's unifier first. If Hanzō wins, Ieyasu would be freed.